Picture the scene, it’s a Wednesday night, you’ve gone to the movies with your friends. You’ve been looking forward to seeing the latest blockbuster all week but on the way in you get less than satisfactory customer service from the cashier; it’s the snack vendor’s first day and takes he takes ages to get your popcorn; then, to top it all off, one of your friends sits in the seat you really wanted. You’ve got two ways to deal with this scenario: a) just accept it for what it is, just a series of unfortunate things, which you’re not going to let ruin your trip out, or b) totally freak out, swear at the cashier, gear up for physical violence against some complete strangers and generally ruin the experience for everyone. Nearly everyone would like to go for option (a) because option (b) is, frankly ludicrous for most sane people to think about. Of course it would seem crazy to flip out over a few small but inconvenient things in the example above, but anyone who has played football has witnessed crazy reactions to fairly trivial things on the field of play, and some of us have even been the perpetrators! Why are you getting angry about a game of football?? You might take issue with the above example: “going to the movies can’t be compared to a physical game of football – it doesn’t have any of the same pressures and doesn’t have anywhere near the same levels of testosterone in the atmosphere”. That’s a fair point, and the example was designed to be a little provocative, but really when you think about it, your weekly game of football is one of your main recreational activities so you should view it like any other – don’t ruin it for yourself or others by temporarily letting go of your sanity! 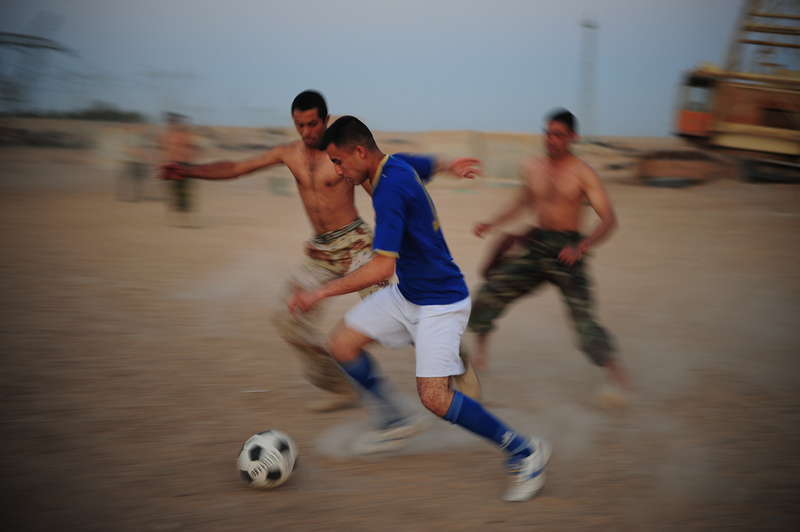 Remember, you’re choosing to play football rather than do something else, so you should be looking to enjoy it. Just like going to the movies, you’re spending time with friends; it’s something you’re choosing to do and paying your hard earned cash for – so shouldn’t you be enjoying it rather than going mental? When people look at it in detached, rational terms, it’s hard to explain exactly why they get so angry on the pitch. In the heat of battle it’s not so easy to think in such a clear way and the mercury can rise very quickly rise on your anger thermometer if you don’t keep a sense of perspective. Try the following to help you keep calm and enjoying your football. Get to know your own teammates, the referees and other players and you’ll realize that generally they’re all normal guys who, like you, are just looking to have some fun playing football. It’s not as hard as you think it would be to get to know loads of people quite quickly. The odd bit of banter with the referee, or some talk with other teams about how their season is going can open up plenty of conversation and you’ll get to know people if you consistently keep this effort up over a period of time. Knowing people will count for a lot – it’ll help you from seeing them as the ‘enemy’ and in turn, they’ll come to see you as a good guy too. Bob Marley had it about right when he sang: “let’s get together and feel all right”. Making the effort to know and understand other people will help you keep your cool. A lot of the stress of sport comes from the expectations we set ourselves about the game we’re playing. A good number of these expectations are frankly unrealistic. Whether you’ve won or lost, it’s not going to make any difference to your life. It’s more important to be pleased with having put in an honest level of effort than anything else. It won’t make you any less of a person if you have a bad game; a bad game is your feedback on what you need to improve next time. Everyone around you makes mistakes: your teammates, the opposition, the referee and you – nobody is perfect, nor does anybody purposely try to make mistakes, so cut them some slack. Somebody’s lack of skill is down to a lack of talent or practice; getting angry with them won’t fix their problems. You are a free thinking individual – the attitude of others does not need to determine your own attitude. You, not anybody else, are responsible for the way you think and behave. Leave justice in the hands of the referee – they’re trying their best, and abusing them is not going to help them or you. Be a man; shake the referee’s hand when you leave the field of play. In sport and in life in general, things aren’t always fair; the best man doesn’t always come out on top, but being angry about it is not a constructive response. Bottling your frustrations can often lead to an explosion of emotions resulting in losing your temper at some point down the line. Don’t let an issue fester and eat away at you. Try to communicate a problem to others in a calm, clear and constructive way. If it’s put in a way that helps them, others will often be glad to know what they can do to fix a problem. Sometimes it’s hard not to feel angry, but we don’t always have to express it in a negative way. Anger is an energy that can be channeled into constructive thoughts. It can improve our focus and inspire extra effort. Try to use your anger and frustration to improve your own performance without it spilling over to others. 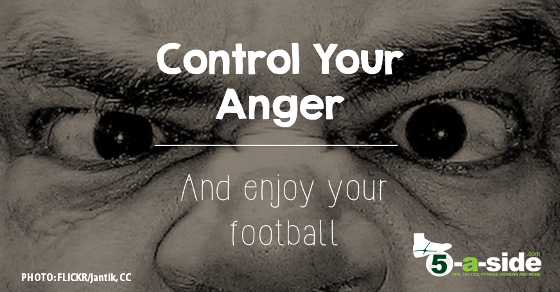 Anger will ruin your sporting experience and, worse still, can turn other people away from the game. Few people want to turn up to play sports on an evening expecting it to end in confrontation. Some players like Roy Keane might have played on the edge all the time (remember his ugly spat in the tunnel with Patrick Viera before the game had even started?) but, let’s face it, who would really want to play 5-a-side with him every week?! Keep a lid on it people, take control of yourselves, enjoy your football and avoid incidents like this – violence has no place in football. Thank you for this information. In practice I’ll be trying to implement this as frankly I’m getting a bit fed up with myself at football, it must be even worse for my team mates. I’m also sick of feeling guilty for days after my weekly 5 a sides. I’ve got to find a different way because if it means others stop coming because of me, i’ll be the one to drop out. Kev, first let me say that you’re way ahead of sorting this just by realising that you need to make a change. It takes a big man to admit that. My advice: work out what football means to you. What do you want from it? For me, it’s an opportunity to keep fit, and to socialise with friends. If something doesn’t go the way I’d want it in the game, it’s not the end of the world and certainly not worth getting angry about. The people I play with are mates and I don’t want to ruin the experience for them or me. Best to let things blow over and have a laugh with the lads after the game. Good luck. Let me know how it goes. You’re not the only one to have found this a challenge. Fair comments and certainly a realistic outlook on the subject from a good angle. Personally I lose my temper when I feel players around me are on my back after every involvement that I have wether good or bad. Personally I think this is a fault with them as from a young age I was taught that all feedback should be positive to encourage improvement. Not focus on what is being done poorly but recommend how it can be improved. It’s usually after a series of negative remarks or shouts from a team mate that I lose my temper and look for the first excuse to go for them. I always manage to contain myself and not totally lose it. This then makes me question if it’s worth playing at all. I think it is and I enjoy it so just need to work on this and manage my anger. Thanks – glad you enjoyed the read. We all find ourselves losing our temper a little when we’re under stress – and being moaned about by teammates is defintiely one of those occasions. If they’re constantly on at you then it might be worth having a calm word about it some time other than in the heat of the moment. Remember, there are teams out there who won’t constantly have a dig at you every couple of minutes – if they’re not going to stop and it’s ruining your fun (after all it should be fun!) then it could be time to look at playing somehwere else. 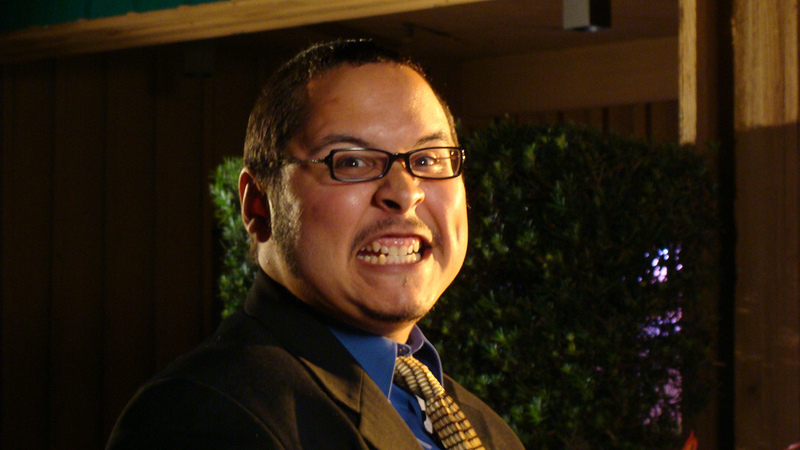 You need to get mad and it will help performance astronomically of you channel it. Hi John, the post isn’t about not being angry, it’s about CONTROLLING that anger. The tactic you suggest of harnessing it to improve performance is mentioned as one way to do that. Playing on the edge with a little anger is one thing. Having it spill over and result in arguments, fighting and other behaviour that makes you no fun to play with is another. It’s that side we’re talking about here, not saying you can’t harness a bit of motivation and competitiveness. Hi Jaymon, thanks for the comment. Just reading this won’t totally fix anger issues on the pitch. You’ve got to take time to try to implement some of these tips, which will take a while depending on the scale of the issue. It’s not an easy one, that’s for sure. If you’ve got any tips that you think would help, let us know.